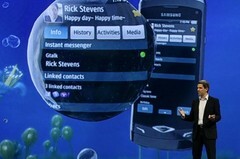 Samsung have released their first phone on their new Bada Operating System – the Wave – at the Mobile World Conference today. The name is appropriate – Bada is Korean for ocean – and so the Wave keeps the whole fluid metaphor going. The Wall Street Journal suggests that the Wave could have a massive break: it cited figures from Ireland-based bookmaker Paddy Power who are offering odds of 4/1 that Samsung’s new touchscreen device will outsell both the Google Nexus One and Apple iPhone globally this year. The Wave features a large AMOLED screen (3.3 inches), a 1GHz processor, Social Hub software and TouchWiz 3.0 User Interface. The AMOLED touch screen is a big deal – according to Samsung it’s the first of its type on a mobile phone and it uses the technology it employs in its TVs. While Social Hub software pulls in Yahoo, MSN, Twitter, Facebook and MySpace, as well as text messages, contacts and calendar events, pushing these to the handset in real-time to keep users in touch. Apps from the Bada App store will be available.